Science theory: How to prepare? Science-tech Current Affairs: How to prepare? Science-tech Contemporary Affairs: How to prepare? Only 3 MCQs from theory: Earth’s magnetism, Desert Leaf Modification and Plant disease spreaders. Current Topic = upto one calendar year old (i.e. 1/1/2017 or newer) Only one MCQ can be pinpointed to last year’s current affairs with specific month and year i.e. Wannacry in May/June2017. Rest of the “non-theory” topics were in news since 2016. Contemporary Topic = older than one calendar block. (i.e. before 1/1/2017). So, out of 13 MCQs: 3 are from theory, 1 from Current and 9 from contemporary affairs. In earlier years, the examiner would ask minimum two to three MCQs from public health and within that, VIRUS used to be a favorite topic- be it Zika, Ebola, H1N1 or even theory of virus. But this year, no question from public health or Virus. However, Examiner’s ICT-prem has intensified: In previous years he had asked about NFC, Project Loon, Lifi, OLED, Cert-IN. This year too, five MCQs from this segment (GPS Application, 3D printer Applications, iOT, Wannacry and Aadhar’s Open API). Last year asked about eLISA-Gravitational waves and Singularity-string theory. 2018: asked about why General theory of relativity has been in news? However, arts-commerce graduates need not lose sleep over it because each year, at maximum, just 1-2 MCQs come from this area. But having said that…. When UPSC asks tough Art & Culture MCQ, candidates became even more obsessed in preparing that subject Because Art & Culture again comes in GS-Mains Paper1. Whereas, when tough Science questions are asked, candidates get more cynical and tend to ignore the subject altogether for Prelims. Because in GSMains Paper3, nowadays UPSC asking mostly generic / overall developments rather than asking about specific inventions, so why bother following individual science theory and individual invention? But, looking at both 2017 and 2018 prelims, it’ll be a bad strategy to ignore Science for Prelims2019. Because other portions (Environment, Polity, Economy, History-Culture) are not getting any easier. Even for CDS, CAPF, State services, science questions are not getting any easier. Both in CDS and CAPF there is a distinct pattern visible wherein science the examiner will ask from 11-12 NCERT or higher level. So, You’ve to stepup your game. Some Arm-Chair Generals looked at the Prelims-2018 paper superficially and are passing hasty & cynical judgements that “ye sab RANDOM-GK Hai, So for Prelims-2019, you should read LucentGK and StatePCS GK type books.” Well, it’s not true atleast for science. After a stressful exam, it’s natural that candidates will also pass similar cynical remarks in online forums. 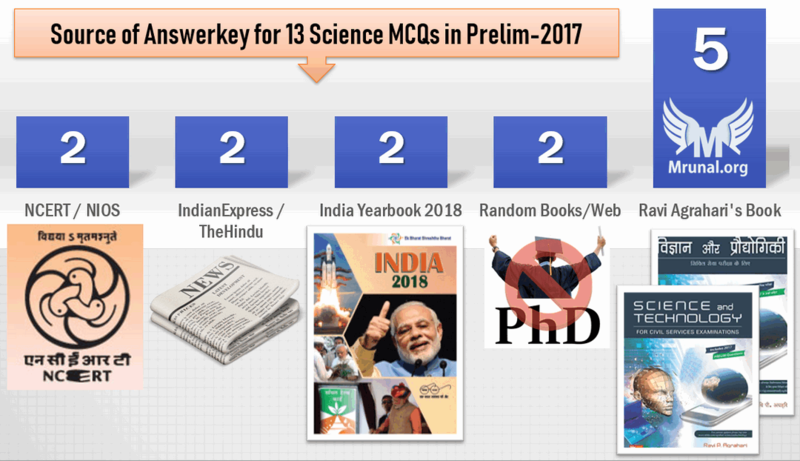 Yes, majority of the science MCQs are medium to tough level difficulty, but 11 out of 13 Science MCQs can be solved from routine books and newspapers only. They were not RANDOMGK / StatePCS type. So, at the end of all that ranting, you’ve to analyse the paper in a dispassionate manner, and accordingly finetune your preparation strategy for the 2019, if you can’t get selected in this round. Way back in 2013-14, UPSC asked very silly and easy questions from science like name of disease in absence of _ Vitamin. So, NCERT (Class7-10) + LucentGK type combo would have sufficed. But in recent exams, hardly any direct questions are coming from there, as if UPSC examiner has stopped pampering the science-handicapped aspirants as well as those who’ve fully mastered it. For example, Newton’s principals and various laws of electricity, friction and optics, various uses of basic chemicals ….– nothing is asked in recent years. For the same reason, going through bulky General Studies Manuals, will give little benefit. So, instead of finishing NCERT textbooks from first to last page, you should do selective study of chapters / topics having relevance with environment, agriculture, public health, biotech, space and ICT/communication. Give more weight towards Class 11-12. Alternatively, you can go for NIOS Physics, Chemistry, Biology and Science Tech PDFs. 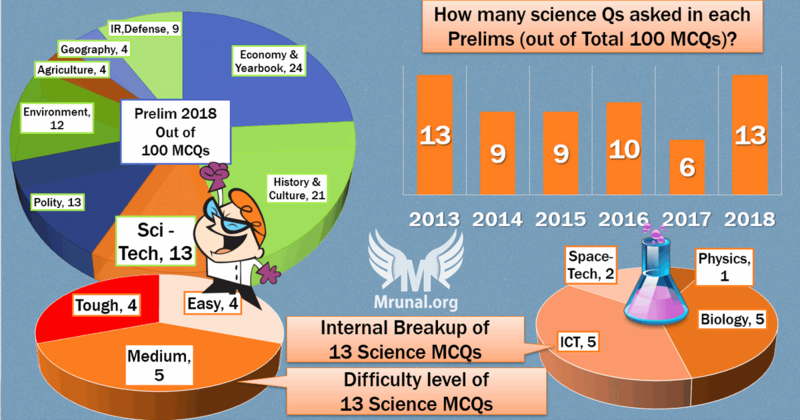 In Prelim-2018, 2 out of 13 science MCQs could be solved from NCERT / NIOS. True that ‘quantity wise’, it’s not a big number, they help you eliminate options, even in other current / contemporary science questions. Ch.31 (Diary of National Event). Although past experience suggests that Ch.25 (Science) can be ignored because no science questions coming from there. Target areas should be: environment, agriculture, public health, biotech, ICT/communication and space. Within space, first priority to ISRO then NASA, then other countries and lastly to the randomly discovered stars and planets. UPSC is different than other exams because both in prelims and mains, they’ll ask about events that happened even more than 1 year ago. Infact both in Mains2017 and Prelim-2018- majority of the non-theory science questions were from events that occurred more than one year ago from the date of exam. In other words, contemporary portions dominates more than current affairs- in Science tech. For this segment, you can refer to Ravi Agrahari’s Science & Tech Book (Macgrawhill) | हिंदी में भी उपलब्ध. The book is useful for both prelims and Mains. In Prelims2017, five out of 13 questions could be solved from here. Target areas should be same as current affairs. environment, agriculture… and so forth. Difficulty: Tough because not given in routine study material, Guessmaster-giri not applicable, and most candidates don’t prepare basic-physics related theory / current affairs in this much detail, because it has almost zero utility in the Mains. 2010: International Team of Astronomers confirmed Albert Einstein’s theory of general relativity and that the expansion of the universe is accelerating after looking at data from the Hubble Space Telescope…. there is an unknown source of energy in the universe which is causing the cosmic expansion to speed up. [Ref: TheHindu1]; 2016: Japanese researchers’ study finds that the expansion of the universe could be explained by a cosmological constant, as proposed by Einstein in his theory of general relativity. [Ref: TheHindu] So second statement is right. This eliminates B and C.
In the remaining options A and D, both have “statement1” common, so we’ve to believe that statement1 is right- Light is indeed affected by gravity, no need to find any reference. Hence we are left with correct answer “D”: 1, 2 and 3 all correct. Some people are doing Hairsplittery that question is not asking what is in that theory, but whether it’s often in news? So, accordingly, either the answer is “B: only 3” or entire MCQ is invalid. But I go with Option D.
Difficulty: Medium because everyone knows #2 is right (Blockchain = Cryptocurrency), but that alone doesn’t help arriving at right answer, until you’ve the factualGK about CRISPR. Although CRISPR got frequent mention in both IndianExpress and theHindu’s science articles throughout 2017, so can’t say classify it in Tough MCQ. Now, Just to satiate my curiosity- what was Belle-II experiment? Ans. It was conducted in Tsukuba, Japan to study violations of the Standard Model of particle physics. So, #1 is wrong. [Ref: IndianExpress 2017-April] But even if you had known that, you’d be still stuck between B or C. So, entire question hangs on whether you know about CRISPR or not. I could classify that as ICT (because Blockchain is asked) , but since right answer depends on CRISPR-the-GENOME-editing tool, so I’ve put it under Biology / Biotech. Difficulty: Tough because it ‘tests’ your understanding of the concepts given in Class12 NCERT geography / biology, and in the real-exam stress, difficult to take a call on #3. On the scale of a million years, the earth’s magnetic fields has been found to reverse its direction. (NCERT Physics Class12 ch5 Page 189). “Million” = 10 lakh. “Hundred thousands” = some figure in lakhs. So, If we don’t engage in Hairsplittery about these two figures, then first statement is right. This eliminates B. There are three stages in the evolution of the present atmosphere….The early atmosphere largely contained water vapour, nitrogen, carbon dioxide, methane, ammonia and very little of free oxygen. (NCERT Class11 Physical Geo, ch2, page17). So, both textbooks prove that CO2 was present, So, #2 wrong = Option B and D are eliminated. Early atmosphere of earth had no free oxygen, the (life) forms until then could at best be only “anaerobic”. Chlorophyll–bearing organisms later released free oxygen which gave greater possibilities for life to evolve. [NIOS Biology Page5]. Ofcourse, biodegradation of dead anaerobic micro-organism could have affected the levels of Carbon Dioxide and Nitrogen but they had such miniscule biomass, so % gas composition wise, these biochemical reactions would have made little impact on early atmosphere. They wouldnot have MODIFIED the atmosphere, unlike the other factors such as solar winds, degassing of the planet, geological carbon cycle etc. This eliminates Statement#3, Thus we are left with answer “A: Only 1”. I classify this as MCQ under biology section, because the ultimate answer depends on how initial living organisms behaved. This is an ANTI-Guessmaster question, because GM-Rule#2: statements with dates, numbers, figures are wrong. so, Statement#2 has to be wrong, this eliminates B and D. But still real answer depends on whether #3 is right or not. But then, Guessmasters would guess casually that planktons and plants released oxygen so early atmosphere changed, but going by the textbooks- it’s not true. Difficulty: Tough because in real-exam stress, you’ve to make a call on whether rain can also spread plant disease or not? There is only Option D where 1, 3 and 4 are together. So, “D” has to be the correct option. Guessmaster-giriTM is Possible: GM-rule#4 that in UPSC “3tf MCQ” (3-statement-true/false), IF each individual statement contains barely 1-2 words then all of them are correct. Ofcourse, this MCQ has four statements but the skeleton is similar, so, you directly get the right answer D: 1, 2, 3, and 4; #WITHOUT-STUDYING-ANYTHING. Difficulty: Medium because you’ve to know specific factual GK that it was developed by Delhi University’s centre. But since it frequently came in GM-related topics in newspapers and magazines during 2016 and 2017, hence not classifying it as ‘tough’. GM Mustard is a perfect flower so it ‘self-pollinates’. Therefore Delhi University’s then VC Dr. Deepak Pental created GM mustard so that he could cross-pollinate Indian variety with European variety to make new hybrid called DMH-11. Hence #2 is right and #3 is wrong. Ref: My lecture on Youtube It was a hot topic for Mains-2016, then again resurfaced in 2017-October when GEAC stalled the permission. Anyways, since it was developed in DU centre, the third statement is wrong and by elimination, we are left with answer B: Only 2. Difficulty: Tough because it’s vaguely worded about “leaf modification” and Thorn vs Spine. Counter argument: Answer is “D”: 1, 2 and 3. Because, Same question was asked in UPSC Prelims 2013 (Set A Q.94). And in the official Answerkey, released by UPSC, the answer was “D”: 1, 2 and 3. Therefore, answer has to be “D”. Guessmaster-giriTM is Possible: GM-rule#4 that in UPSC “3tf MCQ” (3-statement-true/false), IF each individual statement contains barely 1-2 words then all of them are correct. Ofcourse, this MCQ has statements with more 2 words but still the skeleton is similar, so, you directly get the right answer D: 1, 2 and 3; #WITHOUT-STUDYING-ANYTHING. Since UPSC has lifted this from old question bank, so they’d have also copied answer from the same question bank, therefore in all likelihood, default answer will be D, until someone raises objection and UPSC admits the mistake of using wrong words thrones/spines- which is very unlikely given their arrogance, although they did admit mistake of setting wrongly worded MCQ once upon a time in EPFO exam. Difficulty: Easy if you’re following the tech-news regularly. Or, if you have common understanding of ICT to know that passage is definitely not talking about BGP, IP, VPN. The IoT is the network of physical objects which are accessed through the Internet. Internet of Things (IoT) has a broad scope, a heart patient can do heart monitoring easily, farm animals can be easily sensed with a help of biochip transponder, an automobile that has built-in sensors can alert the driver when tire pressure is low. Difficulty: Easy, by common understanding of what is GPS and creative thinking about how and where it could be used. 2018: Government’s EASE framework for Public sector Banks provides for developing mobile app to locate nearest ATMs (so that can be possible only via GPS.) [REF: PIB]. In 2016, PNB bank had already launched android mobile apps enabling the customer to locate nearest PNB ATM using GPS. [Ref: TheHindu] so, yes second statement is right, GPS can indeed be used in Banking operations. This eliminates “A” and “C”, because they don’t contain statement#2. In the remaining options B and D- have “statement#3” in common, so we must accept that GPS can indeed be used in controlling powergrids. No need to waste time finding proof. 2016: The Department of Telecom has mandated that mobile phones sold in India will come with a dedicated ‘panic button’ and Global Positioning System (GPS) facility that can be used to send out a signal in case of distress. This is aimed at improving the safety of women and ensuring a quick response from security agencies. [Ref: IYB ch.8 on communication] So, first statement is right. This we are left with correct answer, D: 1, 2 and 3. Some people are engaged in Hairsplittery that “mobile operation itself doesn’t need GPS, but cell tower and spectrum. Hence answer should be”B: (2 and 3 only)“.” But I still go with D.
Sidenote: While GPS as such as “Space technology”, but here it’s asked in context of “smart applications”, so putting it under ICT. Guessmaster-giriTM is Possible, if you go by GM-rule#4 that in UPSC “3tf MCQ” (3-statement-true/false), IF each individual statement contains barely 1-2 words then all of them are correct. Thus, you directly get the right answer D: 1, 2 and 3; #WITHOUT-STUDYING-ANYTHING. Difficulty: Easy, if you’re following any newspaper – because Wannacry / Petya ransomware was in news during 2017-May / June. EternalBlue is the name given to a software vulnerability in Microsoft’s Windows operating system, because of which aforementioned ransomwares spread. So, all these terms are related to cybersecurity. Difficulty: Easy through elimination and basic idea of the 3d printing technology. Answer: Ravi Agrahari’s Science & Tech Book (Macgrawhill) | हिंदी में भी उपलब्ध (Kindle Location 25643). Bioprinting process in which living tissues can be 3d-printed using stem-cell containing bioink. This means 3D printing has applications in bionic ears (#2) and reconstructive surgeries (#4). There is only one option where 2 and 4 are together i.e. Option D: all statements correct. Ofcourse, some people have doubt, how can 3D printing find utility in data processing (#5). So let’s crosscheck: U.S. Air Force Research Laboratory (AFRL) has developed 3D printed circuitry to produce a flexible Silicon-on-polymer chip. This new chip has a memory more than 7,000 times larger than any comparable commercially available devices. [Webreport: 2018 January], Therefore #5 is also right. Guessmaster-giriTM is Possible, if you go by GM-rule#4 that in UPSC “3tf MCQ” (3-statement-true/false), IF each individual statement contains barely 1-2 words then all of them are correct. Ofcourse, this MCQ has five statements but the skeleton is similar, so, you directly get the right answer D: 1, 2, 3, 4 and 5; #WITHOUT-STUDYING-ANYTHING. Difficulty: Medium. You’ve to know the meaning of Open API. I don’t classify it as ‘tough’, because the meaning is given in India Yearbook 2018. Open APIs shall be provided free of charge to other Government organizations and public (whenever possible). They shall be properly documented with sample code and sufficient information for developer s to make use of the Open API. Open APIs adhere to national cyber security policy. They’re stable and scalable. They’re platform independent, language independent. Does such “Open API” allow Aadhar’s integration in any electronic device (like digital alarm, music player or pendrive?) So, statement#1 is wrong, because it’s extreme hyperbole. So, both statements are wrong (Option D). Counter-argument: These features are lifted Verbatim from Nandan Nilekani’s Blog in TimesofIndia in 2016, where he said, ” Aadhaar provides open Application Programming Interfaces or APIs, which can be integrated easily into any electronic device. These APIs enable online authentication using a fingerprint or iris.” Therefore both statements are right (Option C). GM-Rule#1: All extreme worded statements are wrong. so, first statement has term “any device” so it must be wrong, But since it’s a disputed MCQ- either both are right or both are wrong. So, whether Guessmaster-giri was helpful in this Question? Can’t say until official answerkey is released by UPSC. 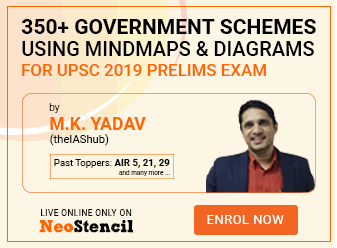 Difficulty: As such every serious aspirant knows about IRNSS is our DESHI-GPS, but in real exam, quite possible that you’ll get confused over how many stationary vs synchronous satellites does it have? Topic was in news from 2013 to 2016. Afterwards, last two years’ India Yearbooks – 2017 and 2018, are mentioning this topic but not covering the specific factoids asked here. Considering all facets, I classify it as medium to tough MCQ (Multi Choice Question). IRNSS covers an area of about 1,500 km around India. So, 2nd statement is wrong. B and C are eliminated. Therefore, Answer has to be A) 1 only. Agni V is an intercontinental ballistic missile (ICBM) with a range of 5,500 to 5,800 km. So, can IRNSS cover “inter-continental” range of 5500 sqkm area beyond border? इतनी जोरदार DESHI-GPS बनाने की अपनी औकात है ही नही…It’s a hyperbole “extreme” statement. on that logic also, second statement ought to be wrong. ANTI-Guessmaster question. If you go by GM-rule#2 that in UPSC MCQs, all statements with dates, numbers, figures are usually wrong, then here all three statements contain figures- Even first statement has figures (4) and (3) so answer should be “D:NONE”- but that’s a wrong answer. Difficulty: Medium because for you need to recall so many factoids / concepts just to answer a single MCQ. Answer: Ravi Agrahari’s Science & Tech Book (Macgrawhill) | हिंदी में भी उपलब्ध (Kindle Locations 6062-6063). ISRO developed PSLV to launch satellites into polar orbits and GSLV to launch geosynchronous satellites into geostationary orbits. Geostationary satellites orbit around the earth in 24 hours and since the earth rotates with the same period, the satellite would appear fixed from any point on earth. So, statement#2 is wrong. This eliminates option B and C.
GM-Rule#2: statements with dates, numbers, figures are wrong. Look at third statement, it talks about four (4) stage, first and third stage…. so, these are all figures / numbers written in words. So, #3 has to be wrong. GM-Rule#5: Word association. Second statement is talking about “Geostationary satellites.” and full form of GSLV is “Geostationary Satellite Launch Vehicle (GSLV)”, that means by ‘word-association’, the PSLV is not ‘fitting in’, so #2 has to be wrong. By elimination we are left with correct answer A: 1 Only. However, here you needed to know the full forms and concepts before applying the GM-rule, so can’t say that you could get the right answer #WITHOUT-STUDYING-ANYTHING. Stay tuned for the remaining parts of the Answerkey. You can get free email updates whenever I post new article, by filling up this form. I neither encourage nor condone shortcuts / hacks / cheatcodes for success in exams. The purpose of using the term Guessmaster-giriTM with Hashtag #WITHOUT-STUDYING-ANYTHING = It’s my wishful thinking that UPSC examiner will take a note of this nuisance going on in recent years, and will stop such opportunities in the future exams, and if that doesn’t happen- atleast everyone should benefit from this knowledge. Ur analysis is great mrunal….. I m waiting for more questions…. I have a doubt regarding the Aadhar Open API Question. I have worked as a Software Developer for 2 years and as part of my job, I used to write APIs. APIs are used to exchange data/services(b/w server and client machine), so Statement2 seems to be correct because as part of Open Aadhar API, the Aadhar’s server could provide for authentication of Iris scans. But Statement-1 is tricky, APIs generally use HTTP protocol(i.e as of now, IOT devices uses some other protocol such as MQTT, etc), and for that internet connectivity(or GPRS connectivity) is required. The statement had ‘any’ electronic device which makes the statement incorrect. Can you please confirm. Every coaching centre’s answer key has given option C/D. Our watch,washing machine(with digital display),inverter etc. are also considered as electronic device….If there was “an” instead of “any” then the first statement would be correct. As extreme it may sound, but in theory and in practice, it is fully possible to embed a fingerprint/iris scanner into a “pendrive”, “music player” or any other physical/electronic object. And in the interest of separation of concerns, the Aadhaar API at the server would care least about which electronic device the request originated from as long as it follows the agreed protocol, encryption, etc. The question about whether the early atmosphere of the earth was modified by living organisms or not is explained in ‘Gaia hypothesis’. Einstein’s general theory of relativity assumes a STATIC universe and therefore includes the cosmological constant.Expanding universe is NOT a prediction of general theory of relativity. sir, please continue your online classes over youtube. The space segment consists of the IRNSS constellation of eight satellites, NavIC. Three satellites are located in suitable orbital slots in the geostationary orbit and the remaining four are located in geosynchronous orbits with the required inclination and equatorial crossings in two different planes. All the satellites of the constellation are configured identically. The satellites are configured with I-1K Bus to be compatible for launch on-board PSLV. IRNSS covers entire India and about (5500 sq. km) beyond its borders. Generally range is given in kilometers. For irnss this range is 1500 km. But in this question area coverd by irnss is given in sq* KMs. But in this question instead of asking the range they are asking about area coverd. Sir, according to this logic is this statment right or wrong? Just google Einstein’s static universe. Einstein theory never predicted expanding universe. Salaam! Sir your satire is extraordinary. Reading you or listening to you ALWAYS makes me laugh! Thank You.